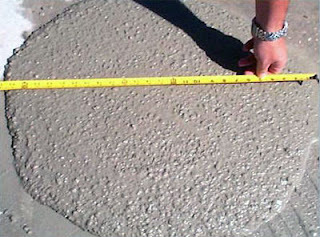 This test is suitable for concrete having high to very high workability . This test consist of a flow table of diameter 76 cm and metallic mould in the shape of the frustum of the bottom of diameter 25 cm top diameter 17 cm and height 12 cm . In order to perform this test mould is centred over the table and concrete is filled in it in two layers.Once the mould completely filled it is raised vertically and the table is raised and dropped by 12.5 mm ,15 number of times in 15 second which causes to concrete to spread over the table. Average diameter of the spread over the table is then measured in atleast 6 directions nearest to 5 mm which is further used to represent the workability in terms of flow percent .That is defined as percentage increase of the average diameter of the spread over the base diameter . Flow %varies in the range of 0 to 150.